Mechanical Dynamics & Analysis’ Control Systems Division (MD&A Control Systems) replaced an industrial co-gen turbine’s original mechanical-hydraulic (MHC) controls with an electronic governor, electro-hydraulic trip system and self-contained control valve actuator. The primary drivers for the project were the operator’s desire to increase the long-term maintainability and reliability by replacing the MHC components that had become more problematic as they reached their end of life. Secondary benefits of the retrofit were increased operability through enhanced remote control and on-line testing capabilities as well as the addition of automatic synchronization. 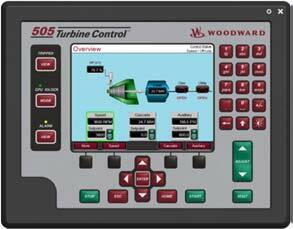 The MHC governor components in the turbine’s front standard were removed and replaced with a Woodward® Governor 505D electronic governor, mounted in a stand-alone cabinet in the unit’s control room. The turbine speed feedback to the governor is supplied by a toothed wheel mounted on the end of the generator shaft and electronic speed pick-ups mounted on the generator’s collector assembly. The governor’s load control and speed regulation software combine with set points from the plant DCS to provide a position signal for the control valve actuator governing the steam flow through the turbine. 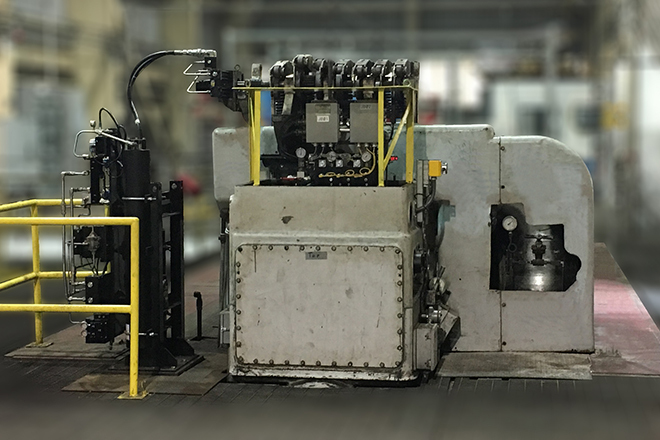 The low pressure hydraulic control valve actuator in the front standard has been removed and replaced with a REXA® high pressure, rotary electraulic™ actuator coupled directly to the control valve cam shaft. This rotary action and direct coupling eliminates lost motion and mechanical hysteresis inherent in the original system. The actuator’s positioning electronics receive the desired position signal from the 505D governor and control the position of the rotary actuator. The electronic to hydraulic interface is provided by the REXA® skid mounted control module and accumulator assembly. The assemblies servo-motor, booster pump and motor, accumulator and trip solenoids provide control over the actuators normal motion, fast motion and trip closed functions respectively. The recommended maintenance cycle for the new actuator components is ten years. The unit’s new electro-hydraulic trip system replaces the mechanical over speed device and trip system components that govern the operation of the unit’s main steam stop valve. The MD&A trip manifold, which is mounted on the unit’s front standard, has a two-out-of-three, de-energize to trip solenoid valve configuration which allows the manifold components to be fully testable with the turbine in operation. Trip and reset of the solenoid valves is governed by signals from a Woodward® ProTech TPS electronic protections system which is mounted in the control cabinet with the 505D governor. The TPS has speed pick-up, pressure switch and relay inputs to provide a single source for all of the turbine’s protective functions including over speed, operational trips and generator protection trips. The customer was satisfied and appreciative of this successful installation. The original installation plan was able to be modified “on the fly” to facilitate easier access to turbine hardware during maintenance outages and utilize the customer’s preferred pressure and temperature transmitter hardware. MD&A’s Control Systems Division maintains a staff of OEM experienced field engineers who provide installation, technical support, advanced troubleshooting, training, and consulting services for gas and steam turbine controls, generator excitation, and auxiliary systems. Call our MD&A Control Systems Division today at +1 (970) 224-2223 or use our Contact form.